Save the Children global artist ambassador Cristiano Ronaldo is known for his sweet soccer skills and his ever-changing haircuts. Now, he is getting hairstyle advice from Omar, a Syrian refugee teen in barber training at Za’atari refugee camp in Jordan. 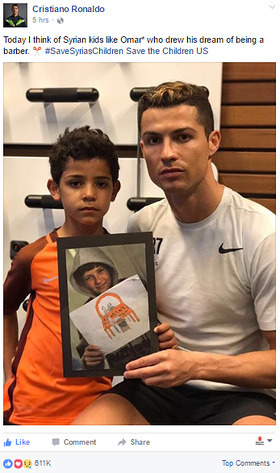 Today, on the six-year mark of the Syrian conflict, Ronaldo posted a photo of himself and his son on his social media channels holding a picture of Omar in an attempt to remind people about those who are most vulnerable in the devastating conflict. In the photo, Omar is holding a drawing of himself in barber training, a picture he drew through Save the Children’s art therapy program – called Healing and Education through the Arts (HEART) – that helps kids process and communicate feelings related to their experiences. Omar regularly attends Save the Children’s drop-in center for adolescent and teen boys, many of whom who work odd jobs in and around the camp to bring money home to their families. The center offers a place for boys to learn and to play. This is where Omar enrolled in a six-month barber training course. Most boys complete the course and take a barbershop kit home to start their own business and earn a living. But Omar had a different purpose in mind. He made a good cause out of it. “I shave and cut hair for old and disabled people and for people who cannot make it to a barbershop,” Omar said. “They call me and I take my kit and go to their house for free,” he added. When asked how he would style Ronaldo’s air if given the chance, Omar said, “Whatever he likes. I think ‘fading’ would suit him.” Fading is the most popular and basic haircut among boys at Za’atari. This “goodwill barber of Za’atari” is just one child among many impacted by the ongoing conflict in Syria. Ronaldo’s post of Omar comes in the wake of a recent report by Save the Children and its Syrian partners. Published in advance of the six-year mark, “Invisible Wounds” includes findings from interviews with more than 450 children, adolescents and adults inside Syria in the largest study of its kind conducted during the course of the conflict. It found that children are living in an almost constant state of fear, terrified by shelling, airstrikes and ongoing violence, with devastating psychological consequences. For more information on Save the Children’s work on the Syrian crisis, go here. To donate to Save the Children’s Syrian Relief Fund, please visit Savethechildren.org/Syria or text SYRIA to 20222 donate $25.